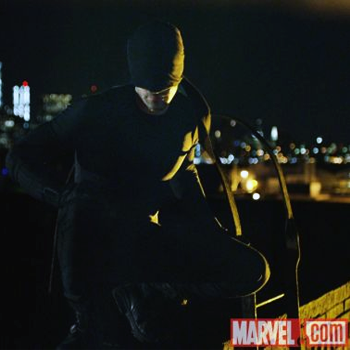 The trailer is light on details and heavy on a gritty neon-urban tone, with only fleeting glimpses as familiar elements like Daredevil's mentor Stick and Vincent D'Onofrio as Wilson Fisk, aka The Kingpin of Crime. Fans hoping to confirm that the titular hero will eventually don his iconic red suit will likely feel let down, as (in the trailer, at least) only the simple black costume - which many have assumed would be a "starter" outift - is on display. The next Marvel/Netflix series, Alias: Jessica Jones, is already in production with Krysten Ritter in the title role. First created in 1964, Daredevil follows the adventures of Matt Murdock, a blind attorney in New York's Hell's Kitchen who by night uses his super-heightened remaining senses to fight crime as a costumed vigilante. Though never as initially popular as some other Marvel creations, the character experienced a renaissance when writer/artist Frank Miller transformed the series into a gritty urban crime comic and introduced new characters like former Spider-Man foe The Kingpin and the ninja-assassin Elektra.